As more and more female instructors assume leading roles in Colorado’s backcountry, by-women-for-women ski clinics, camps and retreats are also on the rise. These programs not only help ladies conquer big challenges, they often come with fun extras like yoga, wellness speakers and après soirees. Whether you’re just starting out or an experienced outdoorswoman looking to beef up your skills, here’s how you can gain some serious girl power on your next visit. Ready to grab life by the ski poles but not sure where to start? As the name suggests, this outdoor program operated by Aspen Alpine Guides is a 100 percent testosterone-free zone. You can enroll in American Institute for Avalanche Research and Education safety and backcountry courses, as well as personalized ski, snowshoe and mountaineering guiding in some of the state’s prettiest (and wildest) spots. Come back in the summer, when offerings include mountain and road biking, trail running and peak climbs. Sometimes, ladies just want to shred together. SheRide Snowboard Camps provide a fun and empowering environment for female riders to fly higher and push themselves farther. Catch one of the camps at Purgatory Resort near Durango (Jan. 26–28, 2019) or Telluride Ski Resort (March 23–25, 2019). America’s longest-running women’s-only ski retreat (Jan. 18–20, Feb. 3–7 and March 1–3, 2019) has united female skiers and instructors since 1981. These days it’s not just one week, but three sessions held throughout the season, featuring morning yoga and meditation, expert instruction for all skill levels and talks on subjects ranging from body biomechanics to gear. Founded by Olympian (and Coloradan) Lindsey Vonn, this ski camp for girls ages 7–14 aims to improve skills, build self-esteem and encourage teamwork in budding athletes. The camps are offered at Breckenridge Ski Resort and Vail Resort in one- or three-day sessions. For grown-up ski girls, both resorts boast stacked schedules of women’s-only programs, including Breckenridge Women’s Ski Week (Women & Wine sesh, anyone?) and Skadi Fest, named for the Norse goddess of winter. “Empowering women through mountain sports since 1999” is the motto of Ouray-based Chicks Climbing & Skiing, which is co-owned and staffed by International Federation of Mountain Guides Association-certified instructors (think of it as an esteemed post-doctorate for backcountry education). The Chicks With Picks program guides women through some of the most challenging ice-climbing spots in the country, including routes in famed Ouray Ice Park. If skiing is more your thing, Chicks With Sticks will take you to some prime off-piste powder stashes. If it’s resort frills and blue-square trails you’re after, stay far, far away from Silverton Mountain in southwest Colorado, where North America’s steepest and highest ski area (13,487 feet to be exact) even puts experts to the test. But for experienced skiers looking for new boundaries to smash, there’s Big Mountain Betty Fest (Feb. 9–10, 2019), a weekend of advanced heli-skiing, hair-raising terrain and hard-earned après parties — all in the company of other [email protected]$# ladies. Hosted by Olympic skiers Deb Armstrong and Ann Battelle, these three-day retreats (Jan. 8–10, Feb. 5–7 and March 5–7, 2019) place equal emphasis on camaraderie and sport. With group breakfasts, lunches and cocktail parties, first tracks in Steamboat’s famous Champagne Powder™ and seminars with inspiring speakers, you’ll leave with some valuable new skills and countless new friends. On most weekdays, you can find a Colorado ski resort that offers women’s-only instruction for every skill level. 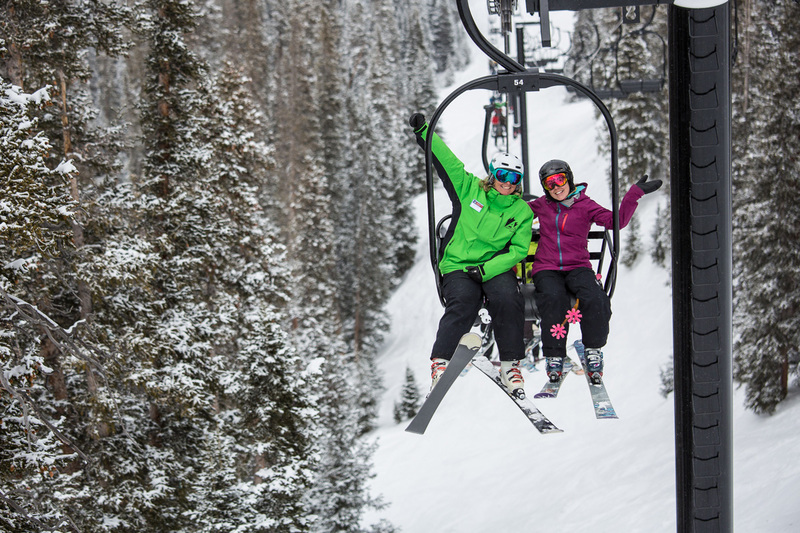 Monarch Mountain near Salida and Copper Mountain Resort both offer Women’s Wednesdays, while Crested Butte Mountain Resort’s Women’s Tips on Tuesdays features female-guided lessons followed by a glass of wine at the resort’s Umbrella Bar. Y-chromosomes allowed,” they proclaim) and Ski Like a Girl! at Powderhorn Resort near Grand Junction. Ready to get your ski on with like-minded gals? Check individual resort websites for dates, availability and packages.